Heanjia provide a full range of conversion services wire mesh products. Custom shapes and sizes can be fabricated to meet clients’ requirements and specifications. Slitting services– Slit coils are a popular choice for clients that require their wire mesh ready for production for filter elements or stamping operations. Slit tolerances – standard of +/- .030”. Tighter tolerances are available, depending on the mesh. Core size – 3” and 6” ID’s. Coils are available with or without cardboard coils. Coil length – up to 2,000’, depending on the mesh. Cutting & shearing services– We can supply wire mesh and welded mesh cut to size to reduce pre-processing cost for our clients. We can cut and shear to any size, with tight tolerances. Our cut wire cloth and mesh will be delivered to you meeting your exact requirements and ready for production. Wire Mesh Stamping – provide customized shapes to meet clients’ specifications and requirements. We offer economical stamped parts in many configurations as well as laser cut or plasma cut parts for prototypes and small run parts. For stampings, we have a wide range of standard round dies. Mesh Laser Cutting-We offer in house laser cutting services for woven wire cloth and welded wire mesh components. 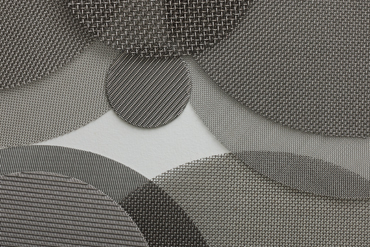 We laser cut wire mesh in almost all alloys including stainless steel, carbon steel, and high nickel alloys. Laser Cut Wire Mesh Shapes-We can provide and endless number of geometric shapes. Wire Mesh Framing – Many applications require that the mesh be enclosed in a frame and that the frame provide a means of attaching it to another component in the production process. We can manufacture custom roll-formed, u-edge, angle iron or perimeter rod frames for your mesh application. Frames are often used to enclose security screens, machine guards, vents and door and window screens.